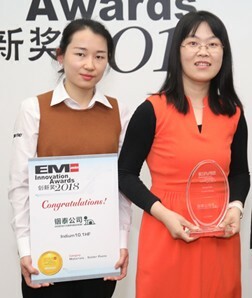 From left: Indium Corporation’s Serena Zhu, Sales Admin Assistant, left, and Mary Ma, Research Chemist, right, accept the award. Indium Corporation earned Electronics Manufacturing (EM) Asia's Innovation Award for its Indium10.1HF Solder Paste. The award was presented in Shanghai, China, during NEPCON China. The EM Asia Innovation Award program recognizes and celebrates excellence in the Asian electronics industry, encouraging companies to achieve the highest standards and push the industry forward. Indium10.1HF is an air reflow, no-clean, halogen-free, Pb-free solder paste specifically formulated to achieve ultra-low voiding, especially in bottom termination component (BTC) assemblies. It increases the reliability of solder joints due to low-voiding, high ECM performance, and solder beading minimization. Together, these qualities enable customers to reduce overall costs associated with end-of-line rework and electrical/thermal reliability that could result in field failures.